If you are daydreaming about a yard with a gourmet outdoor kitchen, a sparkling custom pool and spa, or an ambiance-inducing fire pit, you should begin the process sooner than you may think. 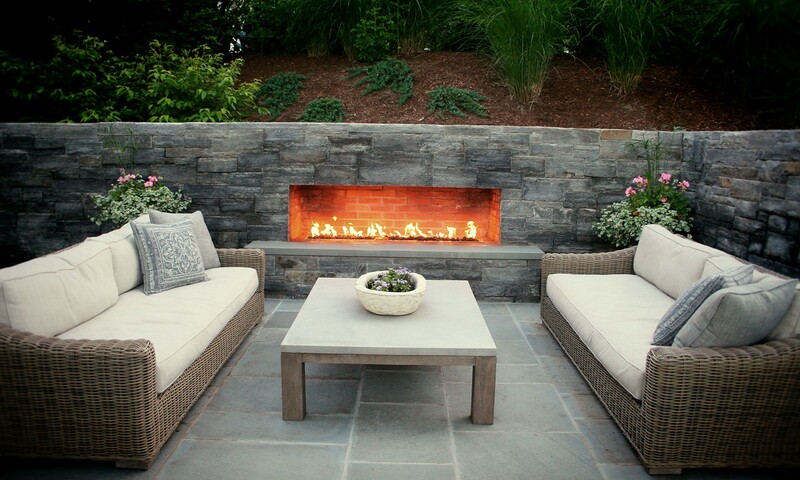 For many of our Connecticut clients, the process of completing an outdoor living space can take up to six months. We always recommend planning at least one season ahead—two is even better. So if you want to be swimming by next summer, the sooner we start the process, the better. Wondering what takes so long? Here is an inside look at everything that goes into creating the beautiful custom pool and spa designs, outdoor kitchens, and other masonry work we show in our portfolio. This first step to a custom pool and spa design or luxurious outdoor living space in Connecticut is for us to come out to your home and survey your property. Whether you want us to figure out the placement of the features you desire, or you have an idea mapped out in your head, we need to see what we are working with. Every property has specific distances from the property line that we are allowed to build in (these are called setbacks), and some towns even specify a certain amount of your property that can be covered with added features (sometimes patios are included in these limitations). Once we come to your home and determine the layout and regulations of your property, we can move forward. Now it’s time for us to head back to our office and draw out the landscape design. Once we have our initial ideas on paper, we will bring them to you for approval—and this process will repeat itself as many times as necessary until you are pleased with the final plan. Most designs needs to be approved by the winter in order for us to get started with them in the spring. After the layout is decided upon, we will get to work choosing materials. From bluestone to granite to limestone and beyond, we will talk about price, maintenance, color options, and more, to ensure you end up with the ideal materials for your wants and needs. 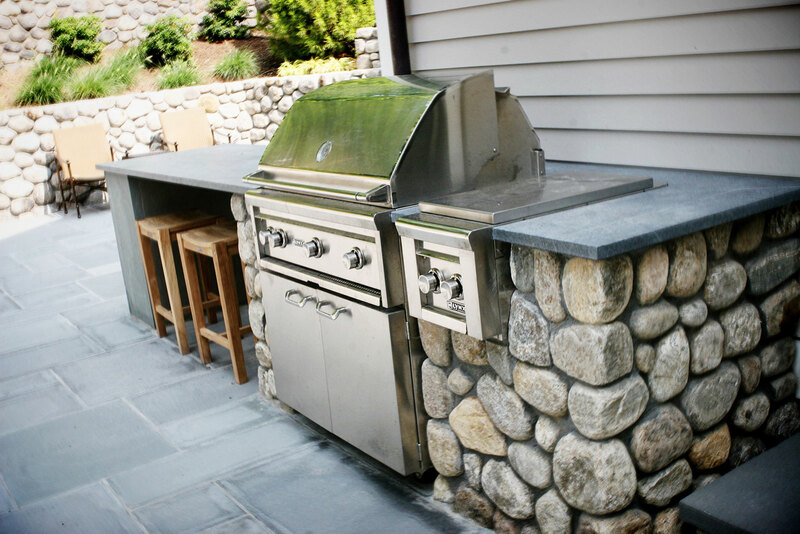 If we are incorporating a rock wall into your outdoor living space, we will also put together a 4’ x 4’ mockup to help you better visualize how it will impact your Connecticut home. Now that the design and layout have been finalized, it’s time to make sure we have all of the proper permits necessary to transform your outdoor living space. We are well-versed in the permit process and zoning laws in each of the towns in Connecticut, and we will expedite the process as much as possible. However, if your property contains wetlands it will take longer. It’s also important to realize that state offices are slow moving during to the winter holidays (usually December 15 to January 15), so we need to account for that. Once everything has been approved, and the weather is cooperating (after the snow has melted), we can put together a realistic schedule for building your new outdoor living space. The actual timeframe will vary depending on the scope of the project, but the sooner we begin the process, the sooner you can be outside enjoying your new custom pool and spa design, outdoor fireplace, or anything else your heart desires. Are you dreaming about a luxurious custom pool and spa design, a gorgeous new outdoor fireplace, or a fully upgraded outdoor living space? Contact Odd Job Landscaping in Connecticut today to make sure you can have it ready in time.